I just flat out love to fish, so why not bring other people out and share the enjoyment. My smiles get bigger and bigger every time someone reels in another fish. I guess it's an illness of some sort but I know of no cure. Make sure you bring your camera because you never know what will be on the other end of your line when you reel in. You will want to keep these memories handy for your jealous friends to look at. Whether its corporate entertainment or just fishing with the kids, make sure to call Custom Charters we will make it happen for you. 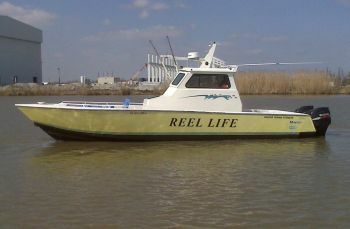 I will customize your trip to accommodate the type of fishing you want to do - hence the name Custom Charters. I supply all of the necessary fishing equipment or you can bring your favorite rod and reel and put it to the test. I use Penn, Abu Garcia, and Shakespeare fishing equipment. Internationals for trolling the big tuna, Penn Spinning for top water tuna action and for mangrove snapper or cobia. Penn Torque reels for bottom fishing and Abu Garcia for inshore speckled trout and red fish. All of this means nothing without fish coming over the side and going on ice. So trust in the fact that with my many years in the Charter business, I must be doing something right. Just remember that at the end of the day your back, shoulders and arms will be tired from catching but the smile you bring home will last a lot longer than the pain. The snapper season has come and gone and it had its ups and downs. Good thing one of the up swings was at the end. It gives good indications of things to come for next year. The last month of the season was the best snapper fishing that anyone has seen in a few years, with monster fish being caught across the coast. Another bonus to the last month was the tuna fishing. It has been awesome. On saturday the snapper limit came in like old times. One of the guys timed our catch and in 35 minutes we had 29 red snapper and 22 lane snapper. It was all Capt. Eric and I could do running around the boat unhooking fish. We shut the catch down saving the open spots for a larger ones if we were lucky enough to get one. Luck would be with us as Capt. Eric found a new spot for us. He was looking at the depth finder and saw a bump on the bottom and what a spot it was. Every snapper was over the 10 pound mark and a amberjack came in also that went 48 pounds. It hurt to leave that spot after only a few to cap the limit, but next year we will test it again. Now it's tuna time so don't wait until it's too late to book your trip, for now, or for the lump season. With the cool weather coming I think I'm going sit in a tree for a couple of days. Good luck fishing, Capt. Tommy Pellegrin 985-851-3304. Its been awhile sence I've been fishing so with the better weather it was off trout fishing down Dularge with Mike and Maurice. The first stop proved the only one we needed, with 75 trout comming to the fish box. The Old Bay Side shrimp in glow with a green tail under a rattle cork worked like a charm. We had quite a few throw backs early but after 12 it was all keepers. Good thing we got the fish today as the next week looks pretty bad for fishing. I guess its back to deer hunting. The Feb. tuna season is fast approching so book your trips early. For your day on the water call Capt. Tommy Pellegrin 985-851-3304. Not a bad day on the water yesterday if you can put up with the thick fog and large ground swells. There was only a light chop on top of the swells so you were only slowed by the fog. The tuna were cooperative as the black fin didn't give the yellows much of a chance. I tried a little trip that Capt. Scott Seaner told me about and it proved a lot of fun. We drifted a Ballistic Flying fish out the back and every time the tuna attacked it we would toss a Tsunami popper in the area and bam fish on. All of these were Blackfins. The yellows we caught were on chunks drifted in the chum before the bonita and Blackfin took over. The largest yellow was 140 pounds and was lots of fun to watch as it took three on the rod at one time. Andrew and his gang wanted a big one and I always say be careful of what you ask for, you might just get it. I was easy with them to start and then I bumped the Tica 30 WTS drag up and watched them moan. I wish I would have remembered my camera because it was definitly a photo op. Andrew you had the best bunch of guys and I'm looking forward to our next trip. The final tally was 2 yellows and 15 blackfin. For your trip call Captain's Tommy or Eric Pellegrin 985-851-3304. The 'HIGH LIFE' was part of the party on the lump Saturday with what should have been great results. It was a little slow fishing due to the large number of boats, but some action anyway. I put the Ballistic flying fish out in the chum slick and had it take off once during the morning but around noon a big blow up on it and then the drift line went and it was off to the races. With the large number of boats I let the fish take us out of the bunch through the anchors and into the open water. After an hour and 45 minutes and all of the anglers on the boat the 50 pound florocarbon leader couldn't take it any more and parted ways to give the tuna another day to gloat over his good fortune. We had the fish 15 feet from the boat once, so we had a good view of the nice yellowfin. I guessed 150 plus but we will never know. This is the second year in a row that this group breaks off on a big fish. OUCH! back to the ball and start over, and bam, another fish draining the Tica 30 WTS. We didn't have as much room to run this time and I got a little heavy on the drag and POW another breakoff, OUCH again. Some you win, some you lose and some just get rained out. We did land 1 yellowfin and a few blackfin before the big fights. The one yellow came on the lightest line we let out. The Tica GN300 with 40 pound Mustad Pro Plus line beat the smaller yellowfin in good time. Even with the large crowd we had our chances on the big ones, we just didn't win the battles. Special Thanks to Capt. Scott Avanzino for the help with the second boat. For your day call Capt. Tommy Pellegrin 985-851-3304. I paid my dues yesterday along with about 20 other boats at the lump. The seas weren't bad early, but got bad as the front pushed through. The current hurt the drift baits but we did luck into a couple of yellowfin and a blackfin. How consistant is your luck. Last week the same guys broke off a very large yellowfin after a long fight, just as they did the year before. Yesterday we took a very rough ride in with the same guys that this happend to last year. It's funny how everyone carries their own luck with them. I'll do my best to make your luck good, call for your trip. Capt. Tommy Pellegrin 985-851-3304. P.S. Come by the New Orleans Boat Show and catch see me during one of the red snapper seminars. Made the foggy trip to the lump yesterday along with some others. Don't know the exact total because when it was good you could only see about 300 feet. The bite was good and we caught 12 blackfin and had numerous cutoffs from kings or wahoo. There were some nice yellowfins caught but it wasn't our day for those. Try your luck see if it's your day, call Capt. Tommy Pellegrin 985-851-3304. We made it out to the lump on Saturday and Sunday with drasticlly different results on the two days. On Sat. it was no current and fewer good fish. We gladly took the 2 black fins that graced our fish box. Now on Sunday it was half the boats and a lot more fish. You knew it was going to be different right away because there was a decent current. We had steady action with blackfins most of the morning. The larger yellowfins were biting but it wasn't our day for them. We ended the day with 10 blackfins and 1 yellowfin. I went from thinking the lump was dead for the year to giving it another try this week if the weather lets. Don't forget about the upcoming snapper season. For your day call Capt. Tommy Pellegrin 985-851-3304.